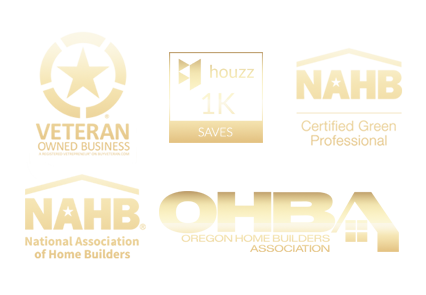 Green Building is not just an “option” with Sienna Building Company, it is the only way we build our homes. Many builders use energy efficient features as upgrade options for their clients. 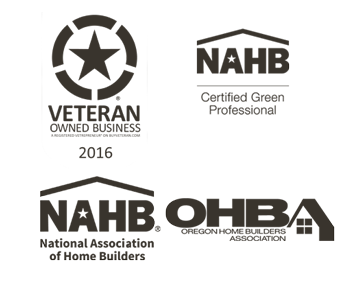 As a Certified Green Professional Builder from the NAHB (in fact the only one in Bend, Oregon) we view Green Building as a necessity not an option. Because many builders view green building as an upgrade, homeowners believe that green building must be expensive. Sure there are many components that drive the cost of building up, but if you are smart in your planning before you design and build your home, then these “expensive options” become commonplace items in your overall budget. Lets use our latest project Bryce Canyon as an example because it happens to be the most energy efficient home we have ever built. In this case we decided to go for the most efficient heating system, a radiant slab (or Hydronic Heat). This is a system of heated water going through tubing that is embedded in the concrete floors. Because this is a contemporary home we decided to have concrete as the finished floor, therefore saving money on carpet, hardwoods and tile. It sure is nice to wake up in the morning and step onto a nice warm floor! We framed eight-inch-thick walls on the main level and used a hybrid insulation system of two inches of closed cell spray foam (which air seals and insulates) and then added six inches of blown in blanket for a total R value 36.4. 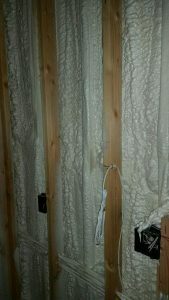 We use this hybrid insulation on all our homes. As we live in a very varied climate, this insulation will serve the homeowner well in both extremely cold weather, and hot summer temperatures. We have not installed a water heater tank in over a decade, preferring to heat water “on demand” with a high efficiency tank-less water heater. Because we were heating the home with hot water, we were able to use the tank-less water heater for both the domestic water heating as well as heating the home! If you have teenagers in the house, you know this will be a lifesaver. We designed the home to have passive cooling. As you know, hot air rises so we simply installed three solar powered venting skylights. When the house gets too warm all you need to do is open a door or window and open the skylights. The homes warm air is quickly replaced with cooler air. So simple. Lastly, the entire home is outfitted with as many LED lights as possible. When you are shopping for LED lights, check if your power company offers any rebates. In our case we saved 33% on the purchase of these very efficient light bulbs. Green building should not be just “an option.” With ever increasing costs of energy it is wise to invest on energy efficient selections for your next home. Our Bryce Canyon project has no shortcuts when it comes to amenities and was built for only $170.00 per square foot, which, in our market, is an exceptional value for a home this well-appointed. Over the past few months we have met with two couples who did not invest in pre-construction planning. But why? First, they both went about the design of their homes without focusing on the number one item first, THE BUDGET. Second, neither of them hired Sienna Building to complete the Pre-Construction Planning for their homes, albeit after the fact. The first reason is easy to understand. Most people are very emotional when it comes to designing and building a home. Maybe their enthusiasm got in the way of their better judgment, or maybe they only heard what they want to hear. Regardless, it is foreign territory to most people. On the flip side let’s talk about how it goes when Pre-construction planning goes right. Here is what our most recent client said about our services. “It was a two-part process: A Pre-construction Planning Phase and a Construction Phase. The way the process was designed made us feel very comfortable to move forward. The process was open and easy. What might have been a difficult process for us simply wasn’t. Words like “very comfortable, open, and easy” are exactly how we want our client to feel before they sign a building contract with us. By taking the time to plan and budget for our client’s house, they had a stress-free building experience and are actually disappointed that the process is over because they enjoyed it so much! In our last blog, we were talking about what can happen when pre-construction planning is not part of your building process. Recently we were approached by a couple who did almost the exactly the same thing as the last couple, designing a home without pre-construction planning. In this case, however, they were working closely with a builder. They designed a beautiful home, had a budget of $200.00 per square foot and supposedly designed to that budget. At the end of the design process, the builder came back and said he could no longer build the home for $200.00 per square foot, leaving the unsuspecting homeowners anxious, frustrated and feeling betrayed. We met with the couple to go over the plans and explain our Pre-Construction Planning process to them. We asked them a couple of really basic questions about their budget and the design. It was easy to show them how we could have easily saved them money during the design process. We then asked them if the previous builder ever asked these questions. Of course the answer was no. After investing over $20,000.00 in design this couple hopes to have the home built for their original budget. What do these two scenarios have in common? First, they both went about the design of their homes without focusing on the number one item first, THE BUDGET. Second, neither of them hired Sienna Building to complete the Pre-Construction Planning for their homes, albeit after the fact. Next time: We’ll explain what is involved in our Pre-Construction Planning system. You’ll hear from an actual client who reaped the benefits of using our proven system.